2016 Asianet Television Awards telecast date and time if fixed, Asianet will air the 2 part on 25th and 26th June 2016 at 7.00 P.M. winners of Asianet Television Awards 2016 will be updated here on monday. we will publish the high clarity event images and more details at keralatv.in Double Horse is the title sponsor of this award show. Asten Realtors, Idea 4g are the other sponsors of this show. every year Asianet conducting the award function to honor serial artists. Asianet only selecting serials from their home channel. All the awards distributing to cast and crew of Asianet serials. 2016 Asianet Television Awards winners list will update here on monday, please wait one more day for the same. we are waiting for the full list of winners and images of the show. Parasparam, Chandanamazha, Karutha Muthu, Kaana Kanmani, Sthreedhanam, Bharya are the serials airing on Asianet. Nivin pauly was the chief guest of the show and aju varghese, roma, anusree , shamna kasim etc attended the function. Karutha muthu bagged majority of awards in 2016 Asianet Television Awards. Kishore satya bagged best actor for his role in karutha muthu serial. Subramanian Gopalakrishnan is the most popular actor for his role on Chandanamazha serial. we will update the complete winners list of asianet television awards 2016 here. Asianet TV Awards 2016 is airing as Two parts in Asianet main channel. High definition version of asianet tv awards can be watch through Asianet HD Channel. 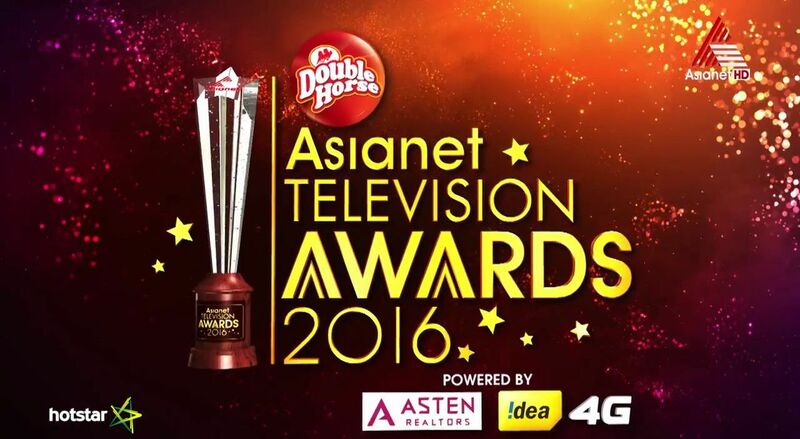 You can the full video of asianet 2016 television awards through hotstar application. It available at hotstar after the telecast on Asianet channel. Asianet Television Awards 2016 Part 1 Telecast – Saturday , 25th June 2016 at 7.00 P.M.
Asianet Television Awards 2016 Part 2 Telecast – Sunday , 26th June 2016 at 7.00 P.M.
please stop all serials, utter nonsense items.